We have two apiaries, one located on the West Wycombe Estate, which we use for beekeeper training, and another in Marlow available to members for the isolation of swarms and re-queening of difficult colonies etc. Our training apiary is situated on a fair sized plot of land in the countryside which offers a good selection of forage throughout the year. Here we have a meeting hut, good dry storage facilities, a chemical toilet, and covered areas to shelter from the English weather when necessary. All the necessary work and improvements to the site have been achieved through the efforts of many of our members who have given freely of their time and energy. The site slopes somewhat towards the south and paths have been constructed to allow safe access to and around the hives. Native tree species have been planted which are now providing some screening and will add to the variety of forage available for the bees. Anyone taking our beginners’ beekeeping course will have the opportunity to do practical training sessions held here. 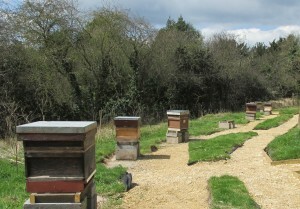 The apiary is also used for the BBKA Basic Assessment held annually, and occasional specialist days. In addition, we hold a beekeeping open day each year. Members of the public can visit the apiary, learn a little about bees and beekeeping, put on a beesuit and take part in the inspection of a hive of bees.